There are three great chances to get your car on track listed on our Driving Schedule page. First up, the annual day after Thanksgiving NASCAR teams souvenir blowout sale and charity laps day at Charlotte Motor Speedway. When is the annual day after Thanksgiving event? Good question, because it's THE DAY AFTER THANKSGIVING! We've attended this event several times and always had fun, gave to a good cause, and usually walked away with some real bargains from the NASCAR teams that want to sell off all their inventory at low low prices now that the season has wrapped up. Next, exactly one week after Charlotte, on December 1st, is another charity lapping event at Virginia International Raceway, located near Danville Virginia. Unlike the big oval at Charlotte, VIR is a real road track with turns that go BOTH ways, elevation changes, and typically hundreds of cool cars and drivers show up to get on this great track. 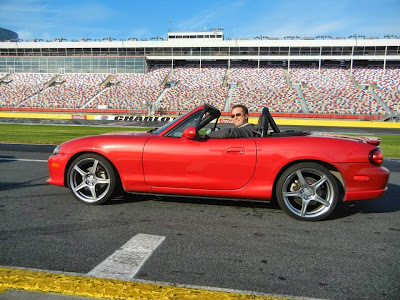 One day after VIR, on December 2nd, there is a fun day of touring laps on the track at Carolina Motorsports Park, which is located north of Camden SC, up close to the North Carolina state line. CMP is a really fun track too, and the chance to just get on track and do some laps in your daily driver doesn't come up very often. These events are not races, and don't require any special safety gear like helmets, so if you're in the area we hope you check out one or more of them, have fun on track, meet up with more drivers, and stay safe! We have links to these events with more info over on our Driving Events page.